Find artworks, auction results, sale prices and pictures of Hans Hoffmann at auctions worldwide. American Abstract OOC Signed Hans Hoffmann Oil on stretched canvas, featuring abstract expressionist composition. 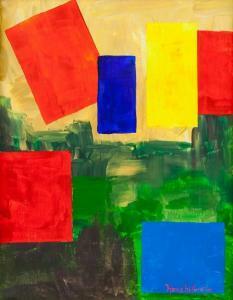 American Abstract School, signed Hans Hoffman on the lower right corner. 50 x 39.5 cm (19.7 x 15.6 inches). PROVENANCE: Southern Ontario estate. Hans Hofmann (American, 1880-1966) began painting in Paris, where he worked alongside such titans of European Modernism as Pablo Picasso, Georges Braque, Fernand Leger, and Henri Matisse. His best-known early paintings combine Cubist structure with Fauvist color, as in Untitled (1943). Although he would eventually be considered one of the preeminent Abstract Expressionists, having relocated to New York in 1932, Hofmann\’s primary interest was in pictorial phenomena: the illusion of three-dimensional space, composition, and the optical effects of color. Certificate by Dr. Rainer Stüwe, Heidelberg, from 13th May 2003, confirming the authenticity is enclosed: „Das Werk ist nach meiner Überzeugung eine unzweifelhafte Arbeit des Nürnberger Malers und Dürerkopisten Hans Hoffmann (um 1550–1591/92) und ist in dem von mir verfassten Werkverzeichnis unter der Katalognummer A 41 aufgenommen.\“ Certificate by Dr. Kurt Pilz, Nürnberg, from 22th October 1979, as „sichere Arbeit des Hans Hoffmann\“ is enclosed. Paulus von Praun (1548-1616), Nuremberg, where recorded in the \‘Praunsches Kabinett\’\’\’\’ inventories of 1616 (no. 90), 1719 (no. 128), and 1797 (no. 128) until at least 1801, from whom acquired by Johann Friedrich Frauenholz, Nuremberg, after 1801. with Erna Burmeister, Berlin, by 1937 (where recorded in an letter of 28 October 1938) by whom offered to the Germanisches Nationalmuseum in Nuremberg (declined). Carl Geyer, Berlin with Prause, Innsbruck, after 1945, by whom sold to, Stapf family, Imst, Tyrol, and by descent to E. Stapf, from whom acquired in 1975 by the father of the present owner. C.T. de Murr, Description du Cabinet de Monsieur Paul de Praun à Nuremberg, Nuremberg, 1797, p. 16, no. 128. K. Pilz, \‘Hans Hoffmann. Ein Nürnberger Dürer-Nachnahmer aus der 2. Hälfte des 16 Jahrhunderts\’\’\’\’, Mitteilungen des Vereins für die Geschichte der Stadt Nürnberg, Nuremberg, 51, 1962, pp. 258-9, no. 20, fig. 8 H. Geissler, Zeichnungen in Deutschland - Deutsche Zeichner 1540-1640, Stuttgart, 1979-80, I, p. 192, no. E6, illustrated. Auction catalogue, Sotheby\’\’\’\’s, London, 30 November 1983, Old Master Paintings, under lot 49. Hundert Zeichnungen aus fünf Jahrhunderten, Galerie Bruno Meissner, Zurich, 1984, p. 28, under no. 2, note 2. 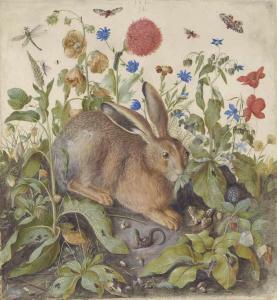 F. Koreny, \‘A Hare among Plants by Hans Hoffmann\’\’\’\’, Art at Auction, London, 1984, pp. 21-2, fig. 3. J. Bialostocki, Dürer and his Critics, 1500-1971: Chapters in the History of Ideas, Including a Collection of Texts, Baden-Baden, 1986, p. 69, fig. 24. K. Achilles, \‘Naturstudien von Hans Hoffmann in der Kunstsammlung des Nürnberger Kaufmanns Paulus II. Praun\’\’\’\’, Jahrbuch der kunsthistorischen Sammlungen in Wien, 1986-87, p. 250, no. 1, fig. 195. F. Fuciková, \‘Historisierende Tendenzen in der rudolfnischen Kunst - Beziehungen zur älteren deutschen und niederländischen Malerei\’\’\’\’, Jahrbuch der kunsthistorischen Sammlungen in Wien, 1986-87, pp. 189-90, illustrated. S. Bodnár, \‘Hans Hoffmanns Zeichnungen in Budapest\’\’\’\’, Acta Historiae Atrium Qcademiae Scientiarum Hungaricae, 1987, pp. 85, 103 under no. 25, 119 notes 46-8, 120 note 94. C. Lloyd, in Master Drawings: The Woodner Collection, exhibition catalogue, London, Royal Academy, 1987, p. 166 note 3, under no. 59. I. Bergström, \‘Hans Hoffmann\’\’\’\’s Oil-Painting The Hare in the Forest\’\’ \’\’, in Prag um 1600. Beiträge zur Kunst und Kultur am Hofe Rudolfs II, Freren, 1988, p. 17. F. Koreny, \‘Hans Hoffmann - Entdeckungen und Zuschreibungen\’\’\’\’, Jahrbuch der kunsthistorischen Sammlungen in Wien, 1989-90, p. 65 and note 20. Auction catalogue, Sotheby\’\’\’\’s, London, 4 July 1990, Old Master Paintings, under lot 14. C. Lloyd, in Master Drawings: The Woodner Collection, exhibition catalogue, New York, The Metropolitan Museum of Art, 1990, p. 190, note 3, under no. 71. K. Achilles-Syndram, Die Kunstsammlung des Paulus Praun: die Inventare von 1616 und 1719, Nuremberg, 1994, pp. 117, no. 90 and 203, no. 121, illustrated p. 443, fig. 44. Auction catalogue, Sotheby\’\’\’\’s, New York, 25 January 2001, Arts of the Renaissance, under lot 91. Vienna, Albertina, Albrecht Dürer und die Tier-und Pflanzenstudien der Renaissance, 18 April-30 June 1985, no. 47. With an expertise by Dr. Rainer Stüwe, June 30, 2011. We are grateful to Dr. Rainer Stüwe for the confirmation of the sheet\\\’\\\’\\\’\\\’s authenticity and for the scientific support in cataloguing the present drawing. Literature: Dr. Rainer Stüwe, Dürer in Kopie - Die Nürnberger Dürerkopisten des 15. u. 16. Jh., Diss. Heidelberg 1997, p. 98; Cat. No. A 3, A 7 and A 37; Fritz Koreny, Albrecht Dürer und die Tier- und Pflanzenstudien der Renaissance, Vienna 1985, Cat. Nr. 13, No. 50 and No 37. 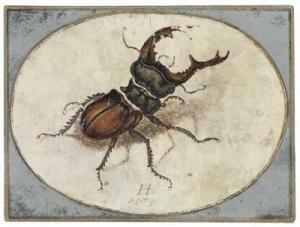 Dürer\\\’\\\’\\\’\\\’s stag beetle of 1505, today preserved in the Getty Museum in Brentwood, Los Angeles ist the model image of this sheet by Hans Hoffmann who faithfully copied the beetle in position and in composition. Around 1600 Dürer\\\’\\\’ \\\’\\\’s sheet was widely known and was frequently copied as an individual motif or within a pictorial context (for example the versions by Joris/ Georg Hoefnagel from about 1580 - published in 1592 by his son Jacob Hoefnagel in Archetypa Studiaque Patris Georgii Hoefnagelii, part II, 1., ed. by Thea Vignau-Wilberg, Munich in 1994 - and the two versions by Hans Hoffmann in Berlin and in Budapest). While the Budapest variant corresponds with its model in the same direction and bears the date 1574 the Berlin version was executed in the opposite direction and has no date. (compare Stüwe 1997, Cat. No. A 37). The present drawing bears the date 1574 and the ligated monogramm Hh. It remains to be examined whether in regard of stylistic criteria the present sheet belongs to a series of copies by the young 20 to 25-year-old artist. The Budapest stag beetle matches with the present example in the three segments of the beetle\\\’\\\’\\\’\\\’s body which are separated by yellow strokes. Even the punctuation between the figures of the date which is rare in Hoffmanns oeuvre are corresponding. One should also pay attention to the frequently documented form of figure „5\\\“ which is also rare in Hoffmanns work but nevertheless exists. The present draft of figure 5 can be found in the depiction of „Thistle, heather and lady\\\’\\\’\\\’\\\’s mantle\\\“ and in one of the blue winged rollers hanging on a nail both dated to1583.(Ill. in: Koreny 1985, Cat. No. 50 and Cat. No. 13). The changes of the animal\\\’\\\’\\\’\\\’s hairs in the two sheets monogrammed with Hh are also remarkable, especially when compared with Dürer\\\’\\\’\\\’\\\’s model – in Dürer\\\‘s sheet they are directed towards the left side while in the sheets of 1574 they are directed towards the right. The two sheets of 1574 differ stylistically in minor details: the detail drawing of the animal\\\’\\\’\\\’\\\’s headshell on the Budaepest sheet was drawn somewhat softer than in the present sheet where the details and the insect\\\’\\\’\\\’\\\’s antennae were depicted somewhat angular. The technique of the two sheets seems quite similar yet; the two drawings share a somewhat rough brush-stroke and a technique of lines closely applied next to each whose colors vary over a basic color hue. This painting technique is apparently characteristic of early works by Hofmann, which do not own the shimmering precision yet of his works from the 1580ies onwards. (compare Stüwe 1997, p.98 and Koreny 1985, Cat. No. 37). The described stylistic differences in Hofmann\\\’\\\’\\\’\\\’s work before his entry into the Emperor\\\’\\\’\\\’\\\’s service are frequently documented, for example in the depiction of a male dragon fly executed in 1577 and a garden spider of 1578 which are in the same collection in Budapest. (Stüwe, Cat. Nr. A 3 bzw. A 7). The manner of gold application in certain parts of the present sheet seems to anticipate works which Hofmann achieved at the Prague court and which show brilliant and partly shimmering surfaces. Moreover, the transverse oval format of the depiction which was applied to the original at a later date reminds one of depictions by Hoefnagel from the 1580ies, who used horizontal oval formats. Apparently the sheet was newly modelled after Hofnagel\\\‘s oval formats which were known through reproductions far into the 17th and 18th centuries. Stylistic and technical accordances with secured works from Hofmann\\\’\\\’ \\\’\\\’s early work in the 1570ies speak for the attribution to the artist. One must also take into account that Hoffmann fell into oblivion soon after his death at the Prague court in 1591 and also in his hometown Nuremberg and that he did not have significant followers. One can exclude a contemporary fake production on a similar artistic level. There are neither stylistic nor technical hints to fakes in more recent times when Hofamnn achieved notable prices in the art market. The present gouache can therefore be considered an authentic early work by Hans Hoffmann and moreover gives evidence of an art production in series after models by Dürer for the art market in the 16th century for which no other master has hitherto made responsible for. Notes: Executed two years after Hans Hoffmann was first listed as a citizen and painter on the Ratsverlässe of Nuremberg in 1576, this vigorously portrayed Crouching cat is a masterly example of the artist's mature work.Hoffmann was probably active in Nuremberg from 1557, and although he may have spent part of the intervening 19 years in the Netherlands, it was Nuremberg that was to have the greatest impact on his work, not least as heir to the artistic heritage of Albrecht Dürer. The period between 1576 and 1584, when he left for Munich, was Hoffmann's most prolific period. He was well known as a portrait painter, but his lasting fame was built on the sequence of drawings in bodycolour on vellum, such as the Crouching cat, derived or inspired by Dürer's own natural history studies.In late 16th century, the greater part of Dürer's studio was in the possession of Willibald Imhoff, grandson of Dürer's close friend the humanist Willibald Pirckheimer, and it was in this collection that Hoffmann would have had the opportunity to study the earlier master's work. Indeed, it appears that the two men may have contrived to 'expand' the holding of Dürer drawings by creative rearrangements of original compositions to which false Dürer monograms were added. It also seems likely that Hoffmann made a record of the Dürer drawings for Willibald Imhoff or his son Karl when the originals were sold. Hoffmann's drawings are in any case rarely slavish copies but take the earlier drawings as starting points from which to explore late 16th century concerns. For example, in Hoffmann's variation of Dürer's celebrated Blue roller hanging from a nail (the variation now in the British Museum, the original in the Albertina, Vienna) he takes the earlier master's careful life drawing and applies a virtuoso touch, emphasising the richness of the tones, applying a sheen of life and impressing us with his technical skill, an approach far from Dürer's meticulous study (J. Rowlands, Drawings by German Artists in the British Museum, London, 1993, no. 268).The Crouching cat is similarly an expression of Hoffmann's talents. Although it does not depend on a known Dürer original it has been suggested that the hindquarters were inspired by Dürer's Hare of 1502 in the Albertina. As with the Blue roller hanging from a nail however, Hoffmann takes what must be a life study and lingers over the carefully delineated soft fur. To this he adds an element of narrative by setting the cat in a tensed pose focussed on a target outside the picture space. This narrative element and the virtuoso handling can also be found in Hoffmann's Red Squirrel in the Woodner Collection at the National Gallery of Art, Washington, which is signed and dated 1578, providing a probable date for the Crouching cat (M. Morgan Grasselli, The Touch of the Artist: Master Drawings from the Woodner Collections, exh. cat., Washington, National Gallery of Art, 1995-6, no. 58).The present drawing remained unpublished until the 2003 British Museum exhibition, when it was shown with its pendant, a Wild Boar Piglet, signed and dated 1578, now in the collection of Jean Bonna (N. Strasser, Dessins Italiens de la collection Jean Bonna, Paris, 2006, p. 9, fig. 2). The scale and degree of finish of both drawings suggests that they were made for an important patron, perhaps the Nuremberg patrician Paulus Praun (1548-1616). An inventory of Praun's collection records a portfolio of 'fine heads, birds, animals and flowers' which was later split and from which most of the Hoffmann drawings not in the Imperial collections now at the Albertina can be traced (K. Achilles-Syndram, Die Kunstsammlung des Paulus Praun: die Inventare von 1616 und 1719, Nuremberg, 1994, p. 244, no. 355). 50 natural history studies in watercolour and bodycolour from the group are now in the Szépmüvészeti Múzeum, Budapest.In 1585, Hoffmann moved to Munich at the request of Duke Wilhelm of Bavaria, before being appointed Court Painter to the Emperor Rudolf II in Prague in 1586. The imperial court was the most active centre of artistic activity in the period, and indeed by the end of the century Rudolf had succeeded in buying the majority of the Imhoff collection. 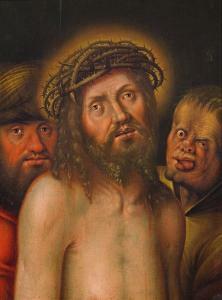 Exhibited: London, British Museum, Albrecht Dürer and his legacy, 2002-3, no. 224. Literature: G. Bartum, et al., in the exhibition catalogue, Albrecht Dürer and his Legacy. The graphic work of a Renaissance artist', The British Museum, 2002, pp. 270-1, no. 224, illustrated.